In Santos, São Paulo, Brazil, a Red-Footed Tortoise (Chelonoidis carbonaris) named Fred, received a 3D printed replacement shell, in order to replace the shell he lost during a recent forest fire. To fix this issue, the good-natured and tech savvy veterinarians of Santos decided that they would use 3D printing technology to create a new shell for Fred! 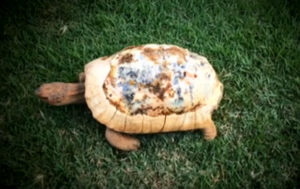 The veterinarians in Santos teamed up with a dentist and a graphical designer and worked for three months to come up with a shell that would protect and cover Fred, as good as his original shell. 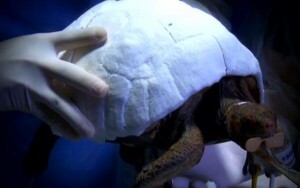 The shell was printed with the same PLA material found on most 3D desktop printers and was surgically attached to Fred. So far it has been holding up well, but researchers are still uncertain how long it will hold up in the wild. For now the shell has been left its original white color, but Brazilian artists have been contacting Fred’s veterinarians in order to see if they can paint it the same colors of his original shell. At this time the veterinarians are still trying to figure out if the paint would be harmful or not. Hopefully all works out for Fred! This story is an excellent example of just how versatile and helpful 3D printing technology can be. dani on IP Policy Workshop Success! dani on First Workshop of the Year; Maker Mentality! Use our hashtag #SBUcreate to support the Innovation Lab on the SBU campus!